With the recent release of the movie Lincoln, kids all over are asking to learn more about the famous President. Here is a great book for them. Almost 150 years after the death of Abraham Lincoln, the fascination with our 16th President is stronger than ever. This November, Steven Spielberg brings us an outstanding feature film simply called Lincoln, a revealing drama that focuses on Lincoln’s final months in office as he pursues a course of action to end the Civil War, re-unite the country and abolish slavery. To accompany the movie, the film’s producers invited Harold Holzer, noted historian and the author of dozens of books on Lincoln and the Civil War-- who also served as a consultant on the movie--to write a new book especially for young readers that could become one of the official tie-ins to the movie. The result is --Lincoln: How Abraham Lincoln Ended Slavery in America, A Companion Book for Young Readers to the Steven Spielberg Film Lincoln (November 20, 2012; Newmarket Press for It Books, an imprint of HarperCollins; 9780062265098; $16.99; 224 pages; hardcover), by Harold Holzer. 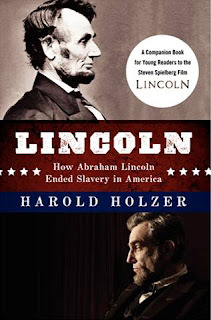 Prompted by the focus of the Spielberg film, Holzer applied his clear, compelling writing style and deep knowledge of his subject to tell the Lincoln story through a new portal -- how Lincoln came to his views on slavery, and how he maneuvered to end it. By so doing, he makes an important passage in American history come alive for readers of all ages. After a preface recounting his experience as a consultant with Spielberg and screenwriter Tony Kushner, Holzer starts his newest Lincoln book on January 31, 1865 —less than three months before the president is assassinated—when he is anxiously awaiting word whether or not Congress will finally vote to pass the 13th Amendment to the Constitution. Though the Emancipation Proclamation two years earlier had authorized the army to liberate slaves in Confederate territory, only a Constitutional amendment passed by Congress and ratified by three-fourths of the states, would end it legally everywhere in the country. Drawing from letters, speeches, memoirs, and documents by Lincoln and others, Holzer covers Lincoln’s boyhood, his moves from Kentucky to Indiana to Illinois, his work as a lawyer and congressman, his unsuccessful candidacies for the U.S. Senate and his victory in two Presidential elections, his arduous duties in the Civil War as Commander-in-Chief, his actions as President, and his relationships with family, political rivals, and associates. Fast-paced and riveting, filled with detail and incident, Holzer’s book provides a fresh view of America in those turbulent times, as well as fascinating insights into the life and actions of one of our greatest Presidents and the constant challenges he faced as he weighed his personal beliefs against his presidential duties in relation to the slavery issue. The passage of the 13th Amendment would become the crowning achievement of Abraham Lincoln’s life, and the undisputed testament to his political genius. Harold Holzer’s Lincoln also includes 30 archival photographs, a brief chronology, historical character list, text of several Lincoln writings, bibliography, and end notes. HAROLD HOLZER is one of the country’s leading authorities on Abraham Lincoln and the political culture of the Civil War era. A prolific writer and lecturer, and frequent guest on television, Holzer served as a Content Consultant to the Steven Spielberg film Lincoln. He is chairman of The Lincoln Bicentennial Foundation, successor organization to the U. S. Abraham Lincoln Bicentennial Commission (ALBC), to which he was appointed by President Clinton in 2000, and co-chaired from 2001-2010. President Bush, in turn, awarded Holzer the National Humanities Medal in 2008. He has authored, co-authored, and edited forty-two previous books, including Emancipating Lincoln: The Emancipation Proclamation in Text, Context, and Memory and Lincoln at Cooper Union: the Speech That Made Abraham Lincoln President, which won a coveted second-place Lincoln Prize, the most prestigious award in the field. He is the author of three award-winning books written especially for young readers: Father Abraham: Lincoln and His Sons, named a National Council of Teachers of English Orbis Pictus Honor Book; The President is Shot!, chosen as a Notable book by the Children’s Book Council and Voice of Youth Advocates; and Abraham Lincoln, The Writer which was named to the Children’s Literature Choice List and as a “Best Book of the Year” by the Bank Street College of Education. He lives in New York. The DreamWorks Pictures/Twentieth Century Fox film, “Lincoln”, is directed by Steven Spielberg, produced by Steven Spielberg and Kathleen Kennedy, with a screenplay by Tony Kushner, based in part on the book ‘Team of Rivals: The Political Genius of Abraham Lincoln’ by Doris Kearns Goodwin. 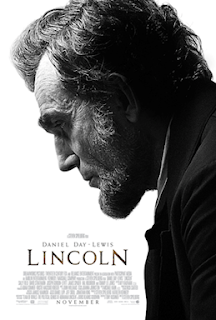 Lincoln is now playing in a theater near you.